Making an appearance here on this humble space today is an indie polish brand that's new to me. I was introduced to Dany Vianna when the lovely Mei Mei from Mei Mei's Signatures sent stunning beauty to me for review. 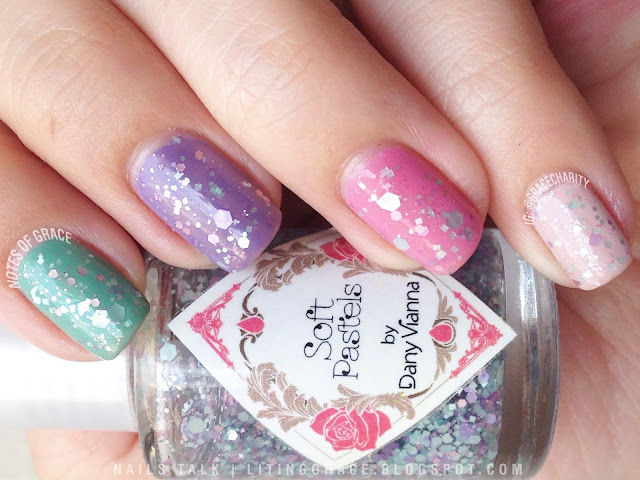 The creator, Dany is a polish lover based in Brazil who recently decided to start her own brand of handmade polishes and the great news for the international ladies is that her polishes are now available at Mei Mei's Signatures! 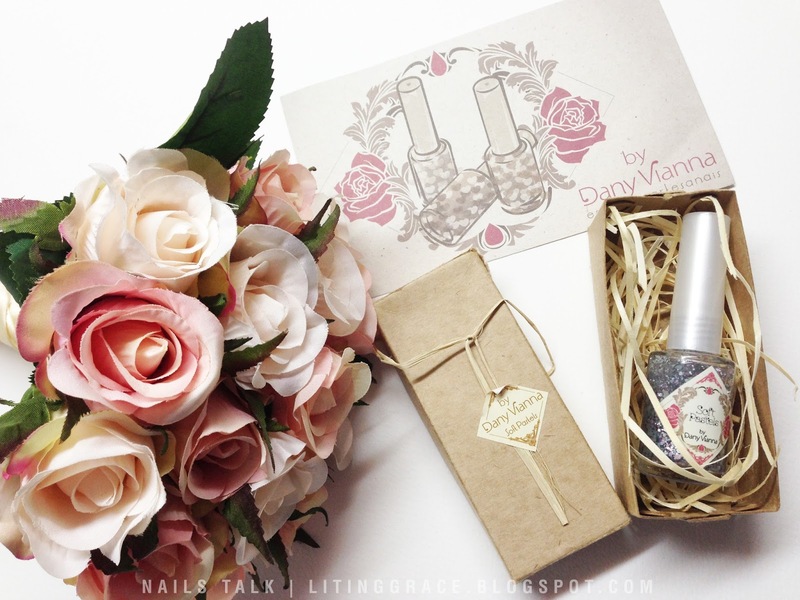 When I first received the nail polish, I was blown away from the packaging! The polish came with its own box and a postcard size greeting card, it's obvious that Dany puts a lot of thought into the packaging. And the label? It's really stunning and one of the prettiest that I've come across so far. Unlike most of the polishes that I owned, Dany Vianna polishes are not three-free, which is typically the case for Brazilian nail polishes. Other than a stronger smell which faded once the polish dried, there wasn't any major issues. 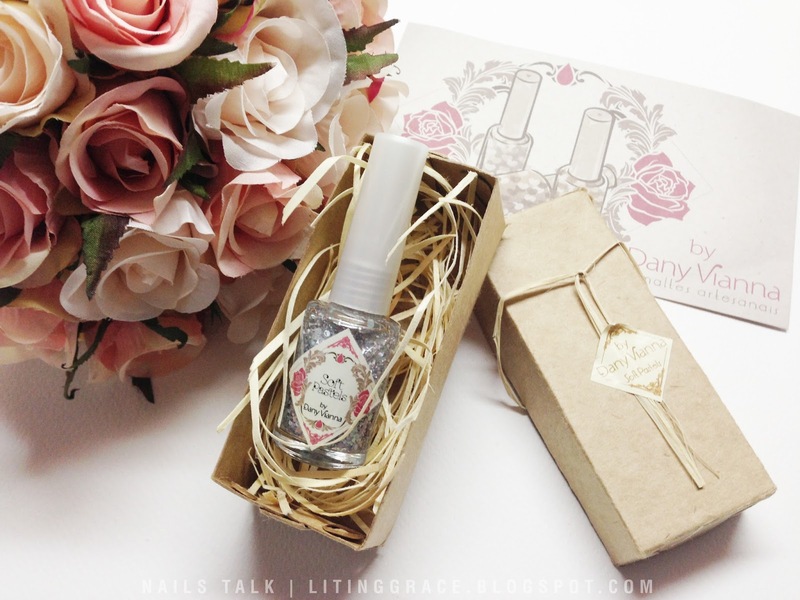 Dany Vianna polishes comes in bottles of 10ml and contains 2 steel beads each. 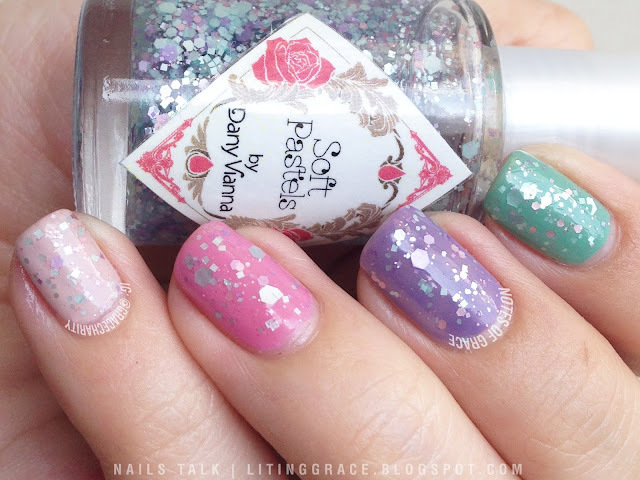 Soft Pastels is a glitter topper with aqua, pink and lavender glitters in a clear base. I have seen quite a few pastel glitter toppers around but have never got down to getting one, so I was stoked when I received this. To test the versatility of the Soft Pastels, I created two looks with it; the first with a dark base and the second, my first skittle nails using colors from one of my favorite OPI collection, colors which I will reveal later. The photos above show two thin coats of Soft Pastels over OPI Yoga-ta Get This Blue, a dark shimmery blue. Using a dark base meant that I could see the contrast and I love how the pastel glitters added a softness to an other edgy look. As I wanted to see how Soft Pastels would fare against a lighter base and because I could not decide on which color to use, I decided to create my first set of skittle nails. For this look, I chose to use Mermaid Tears, Planks A Lot, Sparrow Me The Drama and Steady As She Rose from the OPI Pirates of the Caribbean collection, my favorite collection of all times. I love, love, love how this set of manicure turned out. It was soft but not to the extent of being too girly. I have always been a fan of dark colors when it comes to nail polishes but this time round, this won my heart over. The formula of Soft Pastels was fantastic and the application was smooth. No fishing of glitters was necessary and the glitters was quite evenly spread. Plus point for it not being a topcoat eater, I required only one coat of Seche Vite top coat for both looks. Dany Vianna polishes can be purchased from Mei Mei's Signatures here and retail at SGD14 per bottle inclusive of local normal postage. International shipping to all parts of the world is available. From now till 10th August 2013 (GMT+8), Mei Mei is having a promotion to celebrate Singapore's 48th birthday! Enjoy 15% off selected brands and the good news is Dany Vianna is one of the selected brand! So hurry over to Mei Mei's Signatures now! For updates on new collections and colors, do follow Mei Mei's Signatures and Dany Vianna on their Facebook pages here and here.